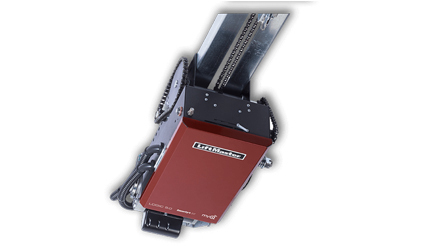 The LiftMaster APT model is a low‑profile apartment house door opener, as manufactured by the Chamberlain group and is for use on standard lift sectional doors. It is rated for more than 100 cycles per day. Motor: Continuous‑duty high‑starting torque motor with instant reverse and overload protection. Available in ½ HP; single‑phase capacitor start motors. Removable without affecting limit switch settings. Drive reduction: First‑stage heavy‑duty 4L V‑belt; second and third stages #41 chain; output on trolley #48 chain. Bearings: Industrial ball bearings on output shaft; heavy‑duty, oil‑filled on reduction shafts. Friction clutch: Adjustable friction clutch helps protect against major damage to door and opener should the door meet an obstruction. Rail assembly: High‑strength dual L‑rail track and quick‑mount header bracket which provides fast, swing‑up installation. Construction: NEMA 1 type electrical box, heavy‑duty 11‑gauge steel frame with durable powder coat finish, all reduction sprockets drilled and pinned to shafts. Delay‑on‑reverse circuit: 1.5-second delay‑on‑reverse circuit to prevent premature door and opener wear. Auto‑reconnect trolley assembly: Automatic reconnect trolley assembly with nylon inserts in case of manual operation. 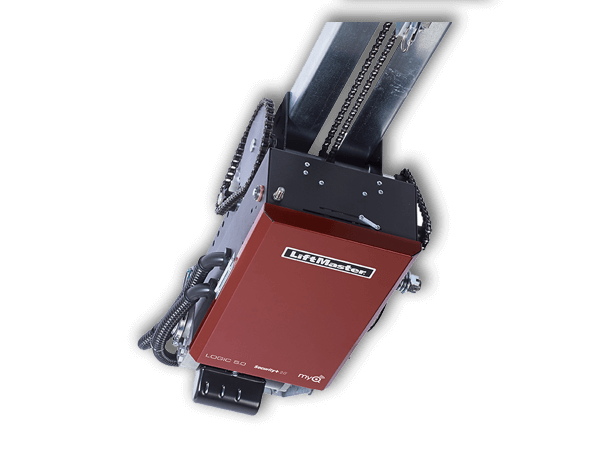 Quiet operation: Quality resilient‑mount motor, nylon inserts on trolley assembly and nylon quiet‑gliding chain guides on rail spacers provide quiet, smooth operation. Low‑profile design: Low‑profile design can be ceiling‑mounted for low headroom applications. Mid‑Stop: Stops the door at programmable mid‑stop during open travel. Maximum run timer: Signals the door to reverse or stop if closing time exceeds maximum by more than 10 seconds.